Parthenia - Gotham Early Music Scene, Inc.
"Parthenia, a first-rate consort of viols... illuminated Purcell's counterpoint wonderfully... [and] the group's sound combined warmth and precision." "Their unanimity and grasp of the style are not unlike that of a great string quartet playing Mozart or Beethoven." "Ravishingly beautiful sound.... The playing by the Parthenia was uniformly superb." "[A]t the Medieval Sculpture Hall of the Metropolitan Museum of Art....Parthenia, a consort of viols, performing a sequence of elegiac music by Byrd, Morley, Frescobaldi, Scheidt and others, sounded especially fine ... and brought welcome tonal variety to [the ] music..."
"...Parthenia, a glowing group of viol players that is one of the brightest lights in New York's early-music scene." "Parthenia played with equal grace, impressive warmth and marvelous blend.... Throughout the night, Parthenia performed splendidly." ""...welcome under any circumstances - the excellent viol consort Parthenia." "There was an appealing musicality in the way Parthenia players addressed the music. Phrases were finely shaped and nuanced, and textures were carefully balanced..."
"The ensemble sense between these players made for flawless musical thought." "The sound produced by all the viols in Parthenia was exquisite... carried out with deft grace and impeccable taste... [Parthenia] achieved exquisite pools of color and emotion through the medium of the viols." "The sound was glorious, watching the performers expressions and rapport a delight...an uplifting experience." "To say these performers understood the music they played would be a great understatement. They brought it to life with vitality and insight." 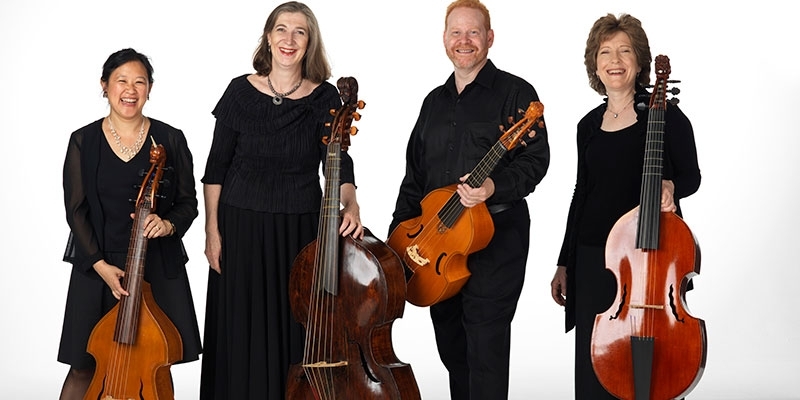 The viol quartet PARTHENIA brings early music into the present with repertoire that animates ancient and fresh-commissioned contemporary works alike with a ravishing sound and a remarkable sense of ensemble. 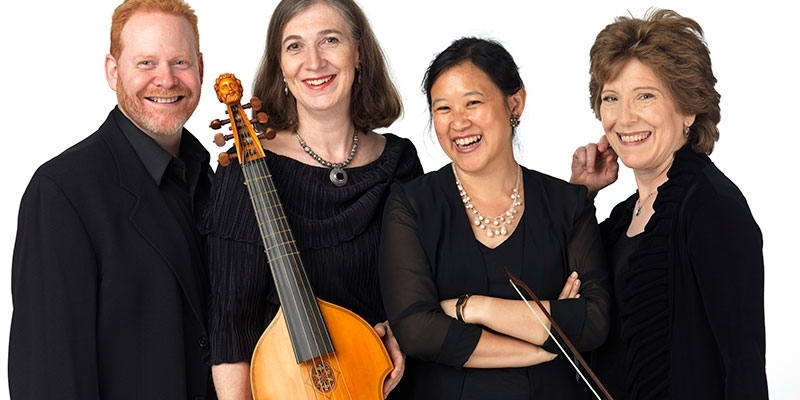 These "local early-music stars," hailed by The New Yorker and music critics throughout the world, are "one of the brightest lights in New York's early-music scene." Parthenia is presented in concerts across America, and produces its own series in New York City, collaborating regularly with the world's foremost early music specialists. The quartet has been featured in prestigious festivals and series as wide-ranging as Music Before 1800, the Harriman-Jewell Series, Maverick Concerts, the Regensburg Tage Alter Musik, the Shalin Lui Performing Arts Center, the Pierpont Morgan Library, the Metropolitan Museum of Art, the Yale Center for British Art and Columbia University's Miller Theatre. Parthenia's performances range from its popular touring program, "When Music & Sweet Poetry Agree," a celebration of Elizabethan poetry and music with actor Paul Hecht, to the complete viol fantasies of Henry Purcell, as well as the complete instrumental works of Robert Parsons, and commissions and premieres of new works annually. Parthenia has recorded As it Fell on a Holie Eve - Music for an Elizabethan Christmas, with soprano Julianne Baird, Les Amours de Mai, with Ms. Baird and violinist Robert Mealy, A Reliquary for William Blake, and Within the Labyrinth. The ensemble's most recent release is The Flaming Fire - Mary Queen of Scots and Her World with Ryland Angel, countertenor, and Dongsok Shin, virginal.